The author draws from research and experiences in Native American and First Nations cultures to show the impact of cultural trauma. The Circle of Courage model provides the core goals for transforming trauma into resilience. The DRUMBEAT program is used across Australia and New Zealand with young people at risk. The author summarizes the theory, practice, and evidence base of this intervention and its link to the principles of the Circle of Courage® model. In this increasingly diverse world, many children are growing up in mixed cultural backgrounds, providing both challenge and opportunity, as seen by this account of a youth with an American mother and a Thai father. Roma people are an ethnic group who are dispersed across many nations with largest populations in Central and Eastern Europe. Pressley Ridge Hungary is taking an innovative approach to reclaiming Roma children. Most discussions of youth behavior focus on the small group engaged in high-risk activities, ignoring the majority of youth who are developing in prosocial ways. This article provides a rationale for reversing this self-fulfilling prophecy which creates the impression that problem behavior is the norm. The authors describe their experiences leading extended motorcycle tours across the United States with groups of Danish youth at risk. The culture that has sustained indigenous people since time immemorial is the essential ingredient for good, democratic schools serving Native American and First Nations students in North America. 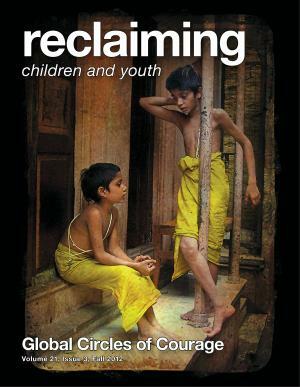 The reclaiming youth philosophy is grounded in the wisdom of cultures that deeply respect children and the vision of reformers and researchers worldwide. This movement is now being carried forward by the Starr Global Learning Network with the goal of building environments where all young people, families, and communities thrive. Bullying has received international attention since the pioneering research over thirty years ago by Scandinavian psychologist Dan Olweus (1978). While prevention programs have proliferated, this article charts new ground by applying Life Space Crisis Intervention (LSCI) to bullying in an example involving young girls. Millions of the world’s children are exposed to traumatic events and relationships every day. Whatever the cause, this overwhelming stress produces a host of unsettling symptoms and reactions. The author highlights six practical principles that undergird healing interventions. A youthworker finds hidden strengths in a young homeless teen mother. Each new edition of the Diagnostic and Statistical Manual (DSM) of the American Psychiatric Association adds new “disorders” which provide a ready market for the use of medication. This medicalization of human unhappiness is now being aggressively marketed to other cultures which have very different traditions of tending to persons in distress. The author highlights five German programs which are using positive peer helping methods to create caring communities in residential and school settings. Indigenous families throughout the world share parallel world views which can clash with the beliefs and methods of professionals trained in Western cultural traditions. This article provides signposts for building cultural safety in work with indigenous groups.